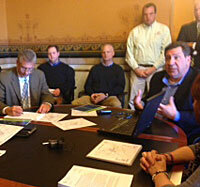 Jeff Lapan talks with legislators. Representatives of the propane industry warn if temperatures don’t go up and demand doesn’t go down soon, Midwest propane supplies actually may run out. Jeff LaPan is an account manager for a Minnesota company that sells propane on the wholesale market in Iowa. He says last week Midwesterners used about 1.2 million barrels of propane and there’s about 5 million barrels left in storage in the region. LaPan testified Monday afternoon before a group of lawmakers in Des Moines, many of whom are hearing horror stories from families who’re using space heaters and closing off sections of their homes to try to deal with the high price of propane, plus the shortage of supply. LaPan told legislators a combination of factors led to this year’s shortage — the shutdown of a key pipeline, below-average supplies on October 1st, higher demand for propane to dry the 2013 harvest and higher demand from homeowners due to frigid temperatures. Brent Vander Leest of Sully Transport has more than 20 trucks headed to Houston, Texas, now to pick up propane and haul it back to Iowa. Vander Leest said Iowa’s governor needs to lobby the governor of Texas to renew that exemption, which expires on Wednesday of next week. Some legislators say they’ll press to put an extra million dollars into the state program that provides grants to low income Iowans to help pay their heat and electric bills. “To help those Iowans who are most effected and most hurt by this shortage,” Representative Todd Pritchard, a Democrat from Charles City, said. Governor Branstad sent a letter to President Obama Monday, asking the president to ease or waive whatever federal regulations he can that might make it easier to get propane to market.